The largest single engined aircraft to serve with the RNZAF began life with work by Grumman's design and technical teams led by W.T. Schwendler. Two prototypes were ordered on 8th April, 1940, and designated XTBF-1. The design allowed for a 1,000 kg internal bomb bay and three defensive positions, with a .30 calibre machine gun in the cowl, and belly position, and a .50 calibre machine gun in a dorsal turret. The first production version of the Avenger was the TBF-1, and these aircraft were essentially the same as the second XTBF-1 prototype. 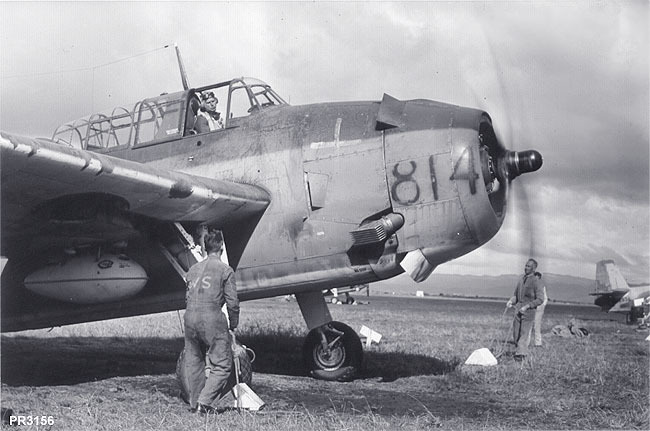 Some defining features of the TBF-1 were the single .30 calibre machine gun mounted on the top right side of the cowling and the antenna mast which was mounted at a slight rearward angle just aft of the pilot's cockpit and mounted on the front of the turnover pylon. The rear cockpit had a seat and basic instruments. Basic flight controls were provided. Because of increased demand for the Avenger, production facilities at Grumman were over- stretched and the Eastern Aircraft division of General Motors began production of exact copies of the TBF-1 alongside the Grumman Wildcat, which it was already producing. To differentiate between these and the Avengers built by Grumman, the designation was changed to TBM-1. The Royal Navy's Fleet Air Arm received 402 TBF-1 and TBM-1 Avengers, and they initially called these aircraft the Tarpon Mk 1. However, this was later changed to Avenger Mk 1.
series production. Note also the position of the antenna. Photo via Grumman Archives . Operational experience with the TBF-1 had quickly revealed that the single .30 calibre machine gun mounted in the cowl was grossly inadequate. 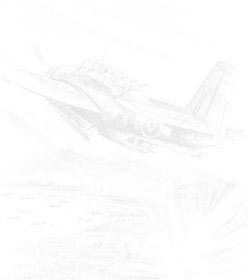 Intended primarily to suppress fire from the target as the Avenger attacked, the lone .30 calibre weapon lacked the range and firepower to do the job. The TBF-1C was developed to deal with this shortcoming, the .30-calibre cowl gun being deleted in favor of two .50 calibre machine guns mounted in the wings. The other noticeable external change to the TBF-1C was the relocation of the antenna mast a little further aft to the rear of the turnover pylon. The antenna mast would remain mounted in this location for all subsequent Avenger production variants. 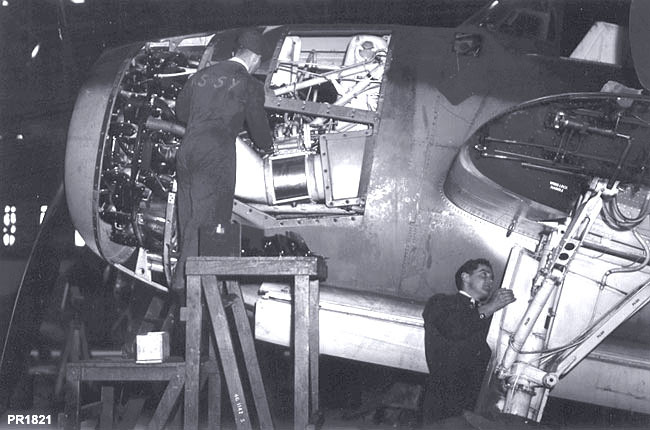 Internally, the seat was removed from the second cockpit and replaced with radio equipment. (The second seat was retained on all Fleet Air Arm Avengers). Note: many of the RNZAF's Avengers, even when officially listed as TBF-1C's, appear to have retained the forward mounted aerial position and the rudimentary flight controls in the rear cockpit (See walkaround of NZ2527). Because the TBF-1C/TBM-1C used the same R-2600-8 powerplant as the TBF-1/TBM-1, the additional weight resulted in a small decrease in performance. Maximum speed fell to 242 miles per hour at sea level and 257 mph at 12,000 feet. By 1944, Grumman had produced 1,525 TBF-1‘s and 764 TBF-1C’s, with Eastern building 550 TBM­1’s and 2,332 TBM-1C’s. Total production of Avengers eventually reached 9,839, of which Grumman produced 2,293 and Eastern 7,546. Development of the Avenger continued post-war, with the Fleet Air Arm putting 100 TBM-3Es into service in 1953. This was typical of the type's post-war popularity as an anti­submarine aircraft. 500 Avengers also served post-war with the U.S. Navy, Canada, the Japanese Self Defence Forces, the French Aeronavale, New Zealand, and the South African Air Force. Although the RNZAF was originally allocated 63 aircraft from Grumman production in 1943, only 48 were ever delivered, with the first six (NZ2501 to NZ2506) TBF-1’s delivered on the "William Keith" in September, 1943. These were delivered by barge to Hobsonville Air Force Base where they were assembled and test flown by Unit 36. The remaining 42 aircraft, all TBF-1C’s, were delivered in four batches in October and December, 1943, and January and February, 1944. TBF being assembled by Unit 36 personnel at Hobsonville, late 1943.
be removed flame damper on exhaust. The first unit to use the new aircraft was 30 Squadron, formed from 8 (General Reconnaissance) Squadron operating Vickers Vincents and Vildebeeste bi-planes for coastal patrol work from Darton Field near Gisborne on the east Coast of the North Island. 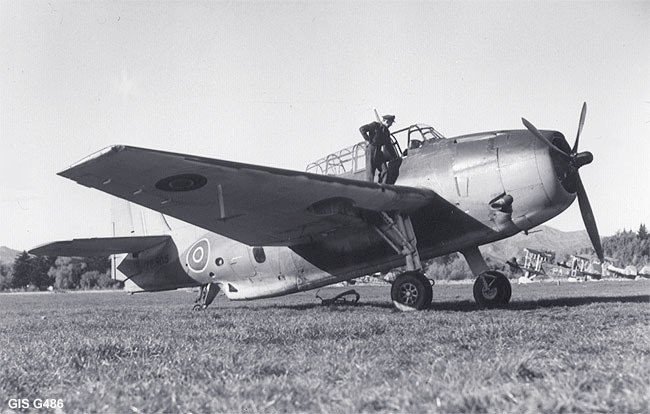 A pilot from 30 Squadron inspects NZ2505, one of the newly arrived Avengers at Darton Field. 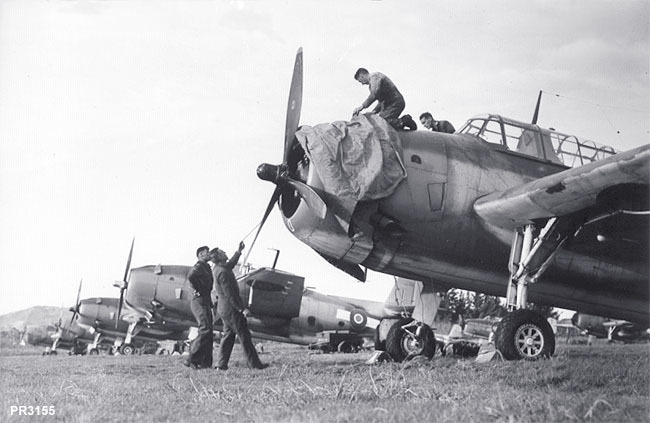 At this time, the ground crew component of 8(GR) Squadron were reformed as 30 Servicing Unit (SU) under the RNZAF's policy to have the aircraft pooled and issued as needed to the flying squadrons for operations. 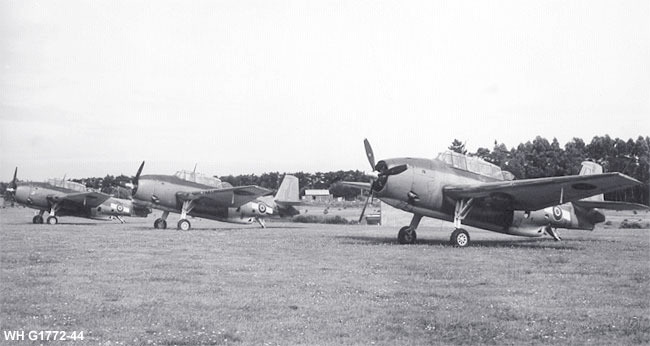 TBF's at Whenuapai, January 1944. L to R are: NZ2508, NZ2523 and NZ2511.